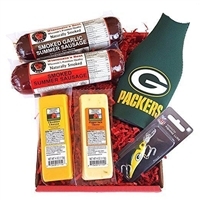 WISCONSIN'S BEST AND WISCONSIN CHEESE COMPANY offer numerous gift boxes that include mixtures of our Smoked Summer Sausages and 100% Wisconsin Cheeses. Some include Green Bay Packer Novelties and/or Wisconsin Badger Novelties. 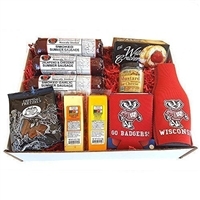 The Gift Boxes are all wonderful choices for hostesses, gifts, Game Day snacks, tailgating and appetizers to name a few. 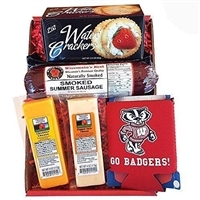 In the tradition of WISCONSIN'S BEST and WISCONSIN CHEESE COMPANY, the SPECIALTY BADGERS Gift Box features Smoked Summer Sausages, 100% Wisconsin Cheeses, Crackers and a Can Cooly. This is perfect for anyone seeking a tasty gourmet solution for a high protein snack as well as a ready to serve snack for any occasion. 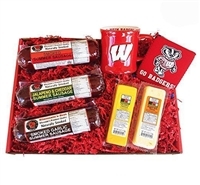 WISCONSIN'S BEST AND WISCONSIN CHEESE COMPANY offer numerous gift boxes that include mixtures of our Smoked Summer Sausages and 100% Wisconsin Cheeses. Some include Chicago Bears Novelties and/or USA Flag Novelties. 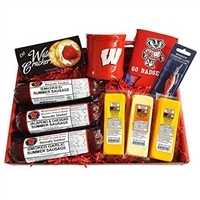 The Gift Boxes are all wonderful choices for hostesses, gifts, Game Day snacks, tailgating, Happy Birthday gifts, anniversary gifts, and appetizers to name a few. 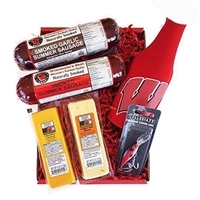 In the tradition of WISCONSIN'S BEST and WISCONSIN CHEESE COMPANY, the BADGER FAN Gift Box features Smoked Summer Sausages, 100% Wisconsin Cheeses and Wisconsin Badger Memorabilia. This is perfect for anyone seeking a tasty gourmet solution for a high protein snack as well as a ready to serve snack for any occasion. 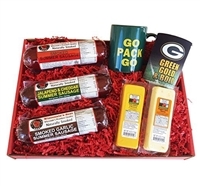 3 Varieties of delicious Wisconsin Smoked Summer Sausage, Cheddar and Pepper Jack Cheese with a Packers Mug and Can Cooler. Some include Green Bay Packer Novelties and/or Wisconsin Badger Novelties. 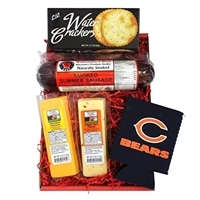 The Gift Boxes are all wonderful choices for hostesses, gifts, Game Day snacks, tailgating and appetizers to name a few. 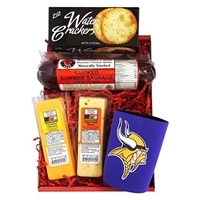 3 Varieties of delicious Wisconsin Smoked Summer Sausage, Cheddar and Pepper Jack Cheese with a Packers Bottle Suit Cooler and Fishing. 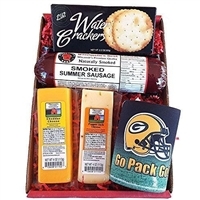 In the tradition of WISCONSIN'S BEST and WISCONSIN CHEESE COMPANY, the SPECIALTY PACKERS Gift Box features Smoked Summer Sausages, 100% Wisconsin Cheeses, Crackers and a Can Cooly. This is perfect for anyone seeking a tasty gourmet solution for a high protein snack as well as a ready to serve snack for any occasion.